Been reading about solar towers and syngas today. Based around a concentrating solar array, where the energy is used to 'reform' nat gas (CH4) into a 'hydrogen rich' gas. So, the solar energy is effectively stored in the gas, chemically, and can be used at a later date through a gas turbine. This seems to have a lot of potential to me, and could smash some of these 'base load' concerns people keep ranting about. From about page 20 onwards in this report. There's lots of background in this report as well. "Is there a summary of the summary?" >"Is there a summary of the summary?" try siting a N plant .far more exciting than a wind farm . Try north head or portsea both close to city and commonwealth land .Biggest draw back is who covers the insurance for a n plant and who pays for its ultimate demolition and clean up usually ignored from the eqation . Believe in UK a plant cost 200 times more to demolish and clean up than to build !! Tony, I am a scientist who has been researching climate change issues in agriculture for more than a decade. From the arguments you have put forward so far I think it is likely that I have done more investigation on this issue than you have. >What did source you use for your data ? Because you obviously didn't read my last post, I will post the information again. was plotted using data from the website (http://www.cru.uea.ac.uk/cru/data/temperature/hadcrut3vgl.txt) you say was used to plot your graph. Your graph and my graph look different to me. >Did you use monthly data ? What year range did you use ? Monthly data for the same period as yours did. Step up to the plate and take Evans challenge because I too would like to know what specific information is needed for you to actually start listening and stop digging up pictures of russian submarines. Or will there be no reply to his challenge because nothing will ever convince you? Even if one loves fossil fuels, and hates renewables, surely one must acknowledge that coal / gas / uranium / (insert next minable resource) WILL run out. Maybe it'll take 1,000 years. 1) We build systems and processes for surviving / living / thriving based solely upon the energy earth receives from the sun, and or earths own internal heat. 2) We source fuels extra terrestrially - either bringing them to earth, or moving ourselves to the location of the fuel. We can talk about nuclear, or carbon sequestration, or how the challenge of producing a viable base load solely on renewables is till we’re all blue in the face, but in the end, I don't think mankind has a lot of choice in the direction. Just a lot of time to waste until we’re forced to agree. I have finally sat down, read all the posts, gone to all the links and successfully avoided all my assignments for the last few hours. I have been an official fence sitter on the whole global warming debate - but after all this my vote goes with Evan n' Co. Sorry Tony - but I believe taking little bits of data, taking them out of context and then trying to poke holes in it is not conclusive evidence. In fact Im not sure what your proof is, as you seem to have changed your mind a few times, You seem to be switching to a global cooling trend - to warming trends, which ever suits your point at the time. You accuse Evan of being a 'true believer' I think this label is all yours. Oh and we are still waiting for where your credibility lies - whats your profession? is it something similar to armchair critic? A bit of transperancy will help your cause a lot. Sorry for a longish post. I was born in Kazakhstan in a city where you can catch an early morning bus, climb a mountain (~4000m altitude) and be back in timefor dinner- that’ what I did almost every weekend for quite some time. After first few years climbing, I noticed that glaciers seem to shrunk. Thought I must have been mistaken as I thought that this kind of processes should take dozens, maybe hundreds of years. Then after a few more years, I looked at my old mountain photos and realized that glaciers did shrunk a bit. This was in the 80’s, some time before Al Gore. I had friends glaciologists, seismologists, hydrologists, these people lived high in mountains for years and they were all in agreement that something’s happening. Actually, one of them is quite a name in mountain glaciology, he works at Idaho Uni now and I can assure that he was not bought by the Global Warming Lobby 20 years ago. Still, he thinks that Asian glaciers are melting due to warming. Last year I went back to KZ for the first time in 9 years and saw something which I can only describe as a disaster because so many glaciers are gone. Mountains became dangerous, rockfalls everywhere. Unfortunately, warming is there, I saw it with my own eyes. Don’t want to go into arguments whether it’s caused by CO2 emissions or by something else. However, I’m not sure if electric cars and solar panels will help reducing the said emissions. They are highly complex devices therefore they require a lot of energy to produce. Could it be that those who think that the best way at this stage is to avoid over-consumption, are right? Turning lights/monitors off, using smaller cars, taking public transport, avoiding bottled water etc? Don’t know where to draw the line though. >Sorry for a longish post. >at my old mountain photos and realized that glaciers did shrunk a bit. >and they were all in agreement that something’s happening. >which I can only describe as a disaster because so many glaciers are gone. >Mountains became dangerous, rockfalls everywhere. >etc? Don’t know where to draw the line though. You are actually using a different data set ... an "adjusted" one, however the results should be similar. You appear to have made a plotting error. The 16th last point should be Nov 2007, which is a strong low point of .229 ... your graph does not show this. When plotted correctly, your data shows a temperature trend line fall of 0.1 degrees since 2001 ... instead of the IPCC forecast warming. Did you read my post with the graph Tony? The challenge for you is there. Nominate what piece of evidence will convince that humans are causing changes in the climate by pumping CO2 into the atmosphere faster than we should be, and I will find it. If I do, you've got to change teams. >emissions of CO2 are changing the climate, and I'll see if I can find it. >Deal? Here's your chance Tony, stake your claim. Deal. Thank you. Any evidence will do. I'm sure the rest of the world would love to see it too. BTW as well as Mann's fraudulent 'hockey stick', you can also forget about stratospheric cooling (no change since 1994). You may also care to look at temperatures over the past 100 years. 80% of fossil fuel consumption occurred after WW2 ... ie 1945 ... which is where the "alarming" warming should start. However warming between 1946 and 2009 is .011 degrees per annum compared to .016 degrees per annum for the first part of the century ! Pick different dates and you can get almost any values you want. Between 1940 and 1970 temperatures fell. Between 1971 and 1998 temperatures rose. After 1998 temperatures have shown a slight fall. ... despite sudden increase in fossil fuel burning after 1945. With the recent increase in Somalian pirates, I wouldn't be surprised if pirate numbers show a better correlation with temperature than CO2. Sun spot numbers certainly show a good correlation with temperature ... although even such a good correlation alone is not proof. It is also important to keep these tiny temperature changes in perspective. The IPCC wants you to pay $1000+ each year to ATTEMPT to limit a change that is 1/100 th of temperature recording accuracy (sound ridiculous ? ... it is !) . Wouldn't you prefer to spend your $1000 on climbing gear, rather than political nonsense ? >Deal. Thank you. Any evidence will do. Try and be more specific. I've given you lots and lots of evidence, and you haven't considered any of it good enough. What format, what data set, what piece of information will show you the link, once and for all. Can you please repeat then, in your own words, what you think is your best evidence than man's CO2 is causing global warming or cooling. There is no question that temperatures have increased over the past 180 years since the Little Ice Age. There is no question that CO2 in the atmosphere has increased in the past 50 years. It is possible that man's CO2 has caused some of this increase, although the oceans emit 20 times as much CO2 as man. I have seen no evidence to prove that man's CO2 has caused any of the warming. There's no lack of addressing these points but as you seem to struggle with the concept of following links I shall help you out with a few. >Between 1940 and 1970 temperatures fell. There's a phenomenom call dimming, ie, all the other pollutants in the air blocked some of the heat getting through our atmosphere in the first place and as we've cleaned our act up a bit, that effect has gone and we started seeing the actually warming. Plenty of info on this around, feel free to follow the many links provided to just a few of the places that will provide great detail about it. >Between 1971 and 1998 temperatures rose. yup, we agree on this!!! >After 1998 temperatures have shown a slight fall. 1998 was the hottest year on record. Have a look at the other 9 of the 10 hottest years on record and you'll find many of them in the 10 years since. It's not showing an over all cooling, just a collection of not quite so extreme but still in agreement with the general trend of warming years. You don't get such a high representation of the hottest years around in a period of cooling. Really, you are repeating yourself willy nilly without seeming to have done any follow up on the information provided. Can't you at least try and rebuff the responses offered to you rather standard denialist claims instead of saying the same things over and over again? For example, explain to me why these are our hottest 10 years since records began with all bar 1 in your proclaimed period of cooling? Out of vaguely following all of this thread, I have one big question. Who do Evan and Tony work for? Now, I admit to not knowing what the hell is going on with sunspots or what even a sun spot cycle is. 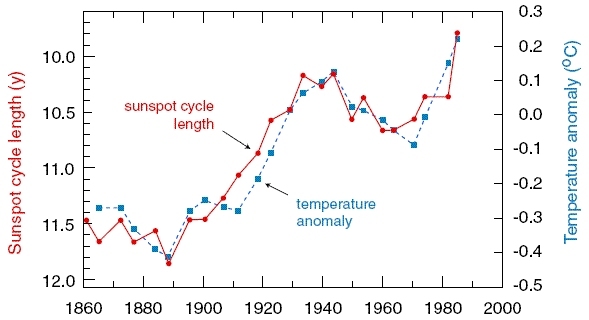 So can you please explain then how you think that sun spot cycles are affecting global warming and what makes this a stronger case than the connection to co2? >Out of vaguely following all of this thread, I have one big question. >Who do Evan and Tony work for? I work for the Department of Energy, Resources and Tourism in Canberra. Before that I was at Sydney Water, and before that Intercast and Forge. I did a BSc at Sydney Uni in physical Geography, then BEng in Mechanical at UTS. Not sure about Tones. He's dodged that question a few times.